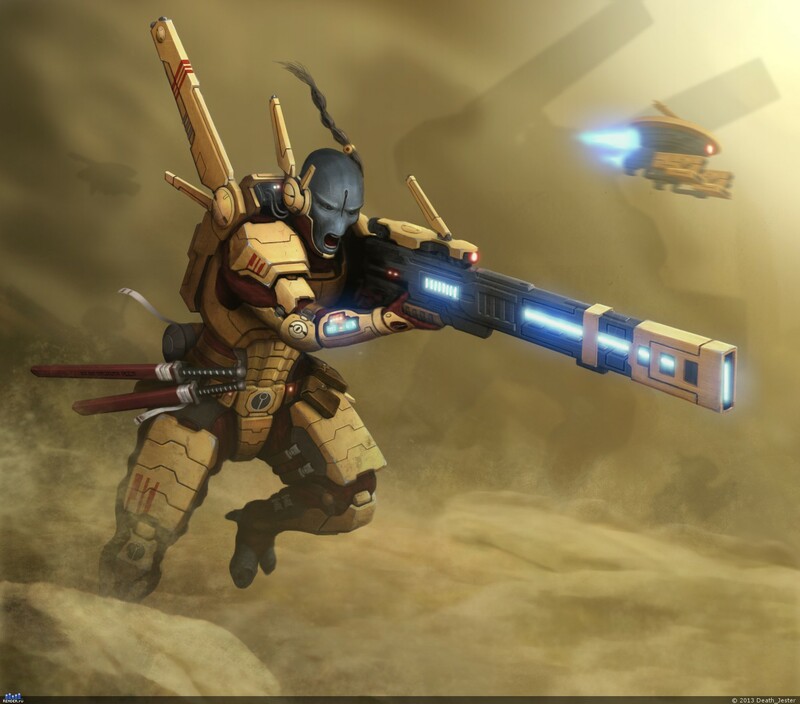 Warhammer Tau: Tau Codex Leaks: New Formations! They are all over the web now. You can check just about everything you would want to know about the new codex HERE. For now, I want to do a quick overview of each detachment/formation. These have only just hit, so I won't be able to comment on their actual effectiveness on the tabletop, but I can theorize. Here we go. Bonuses: Warlord can re-roll for warlord trait. Units within the Contingent can combine firepower into a single shooting attack, benefiting from all the special rules they would if they were a single unit. If 3+ units combine they all get +1 BS. Summary: Pretty amazing. If you can fulfil the requirements (not cheap) you gain unparalleled army synergy. Large single targets will stand no chance against your army if you can combine all attacks into one and get all the attending bonuses. Imagine being able to use the Buffmander's bonuses on Riptides again, or the Stormsurge, or Hammerheads, or ALL of them! It goes without saying that someone in this Contingent needs to have the Signature Systems to get the most of this ability. Markers will help too, especially if they are on a Skyray. Boosting a ton of snap shots against a Flyer just got way easier. In essence, this makes your army (because this Contingent will be your entire army) excellent at bringing down specific targets in typical Kauyon fashion. The price for this detachment will vary wildly, but I would expect it to run at least 1000 points. Bonuses: Units can run/move Flat Out then shoot if they are within 12" of the Commander or Fireblade. Almost as good as Eldar! They also get their Supporting Fire range boosted from 6" to 12" when supporting other units in the formation. This is the only Core choice available for now. It is always possible that we will be given another "Core Choice" later on. Perhaps in the second Damocles book where Farsight is rumoured to make his appearance. This would be awesome, as I am not all that impressed with this formation. The entry level is 344, which sounds reasonable, but it isn't. That is minimum sizes for everything, using pathfinders, sniper drone teams, etc. Typically, I would expect this formation to run at least 700 points, but it could easily turn into your entire army (It is an expanded Combined Arms Detachment after all). The run-then-shoot has its uses, but is only local to the HQ choices and can't be used if you combine firepower (see the Hunter Contingent). All in all, the formation is fine, especially if you already field lots of Fire Warriors or Kroot. The "tax" is going to depend on what your army usually looks like. For example, I seldom use Fire Warriors or Heavy Support options, so both of those are a tax for me. However, someone else might already include all these things in their army, so it is just a free bonus. In any case, you will probably take this formation with the intention of building a Hunter Contingent and landing that super awesome combined firepower bonus. Summary: At cheapest, this is going to set you back 117 points, but if you make the units you take actually useful and maybe throw in an Ethereal then you are looking at around 400. Note that this is where you have to take Shadowsun. I think that means you can't take her in place of a Commander in the Hunter Cadre or the Retaliation Cadre. It is also the only way to get an Ethereal of any kind into your list outside of a Combined Arms Detachment. I kind of like that, making Ethereals rare is fluffy and neat. Bonuses: Vespid get Infiltrate and Stealth (Forests). Kroot within 12" of a Vespid get their Stealth (Forests) boosted to Shrouded (Forests) and get +1 BS. They all get Supporting Fire but can only support units within the formation. Summary: Unfortunately, this formation will rarely get used by anyone, because Vespid are just so darn expensive. Someday Vespid will be worth it, but it is not this day. Plus, the formation's bonuses are almost all tied to tables with lots of Forests on them. Outside of a themed game on a particular table, the formation is just a bunch of fragile units with little-to-no teeth. Entry level price is 384 points, but that doesn't include the Vespid strain leader upgrades, which many find mandatory for the leadership boost. You'll also want to add in some Krootox to take advantage of the +1 BS on those high strength Kroot Guns. Bonuses: The Ghostkeel + any Stealths within 6" get Ignores Cover. They also get +1 BS and their weapons are assumed to hit the rear armour of any vehicle they hit. Summary: One of the winners in my book. It is a shame that you have to buy a Ghostkeel to give the Stealths the boost they need to get fielded, but at least the Ghostkeel isn't one of the lame ducks of the codex, and it is a really cool looking model. The rear-armour trick is simply awesome. If Necrons had tears this formation would make them cry, and it allows the cadre to threaten quite a few vehicles that they wouldn't normally have a chance against. The entry level price is 310 points, which isn't cheap, but better than some of these other formations. Adding Ghostkeels will increase the price dramatically, but if you can get 3 of them you'll be shooting BS5, ignoring cover, and hitting rear-armour without any support. Bonuses: Relentless. +1 BS on the turn these models Deep Strike. You can choose to have the entire formation (XV88 included) Deep Strike on turn 2. Summary: Not a bad formation at all. Relentless helps the Broadsides shoot stuff on the turn they drop, but it is a pretty spiffy bonus anyways. If they survive they can move and shoot for the rest of the game! Even alone, it is a nifty formation that requires little support. It is less effective after that drop turn, but the Mont'Ka is all about crippling your opponent so he can't hit back right? This formation is one of the more expensive ones, with a minimal entry level of 396, but that has no weapons on the battlesuits. Since Crisis teams can come in units of up to 9, this formation could be absolutely huge. 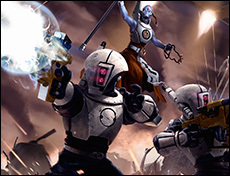 A few basic squads with standard upgrades is likely to run 800-900 points. It is a lot to invest in a powerful second turn, but if you can pull it off it could be absolutely devastating. Bonuses: Every chooting phase you pick a point on the board. When shooting targets within 6" of that point, the formation can re-roll failed To Hit rolls. This formation is a bit more useful against air targets, but it really has to be in the Hunter Contingent to start being handy, and that is quite expensive. Tau Vehicles took a pretty big hit in 6th, with only a formation boost to accuracy for full units in 7th, This formation isn't near enough to warrant using them in numbers again. Bonuses: If a unit lands 3+ marker hits on a target, that unit automatically gets hit by a Seeker missile. If one of the formation's units is destroyed, you can bring in ALL of your reserves automatically on the next turn. You could use this formation to bait your opponent into giving you your reserves on the 1st turn if you are going second. You'll have to give up First Blood to do it though, and it might not work for the Retaliation Cadre. The entry price level is at least 352. If you assume the Pathfinders are trying to get marker hits for the Seekers, bump up some Piranhas, then you're looking at around 600 points. If you are using the Pathfinders as bait to bring on your Stealth Suits for the attack, this will be more like 700. Either way, the maxed formation isn't that expensive compared to the top levels of other formations. It could be interesting, we'll just have to wait and see how people take advantage of it. 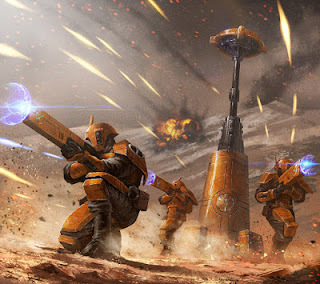 You certainly can bring a lot of Homing Beacons for Deep Striking in lots of battle-suits right away, so this could be a good addition to the Hunter Cadre, replicating the Retaliation Cadre's reserve manipulation for some of the battlesuits in the army. Bonuses: Similar to the Hunter Contingent, all the models in this formation can combine firepower and bonuses (markerlights, Command and Control Node, etc). During this attack, they get Monster Hunter and Tank Hunter. Summary: The age old formation that has kept Tau alive in the tournament scene since it was given to us as a Christmas present. It is a bit easier to field now, since you don't have to have maxed Broadsides, but the bonuses are notably reduced. For starters, you have to fire ALL the squads at the same target to get the Monster/Tank hunter rule. They also lost Preferred Enemy: Space Marines. The added flexibility in composition is welcome, reducing the entry level price to 310 instead of the previous 500ish points. If you can fit this formation into the Hunter Contingent, then you'll get the +1 BS when the formation targets something too. It is also another way to grant shooting special rules to other units without requiring the Puretide Engram Neurochip. A good formation, just like before, but now that it actually has competition it isn't quite the auto-include that it used to be. Bonuses: Ignores Crew Stunned/Shaken on a 2+ and each turn you roll a die per hull point missing. Each 6 rolled repairs a hull point. Summary: The bonuses aren't bad, keeping your flyers shooting and moving at all times, possibly longer than usual. The repair bonus is better than an Automated Repair System (1 per hull point instead of 1 per vehicle). The point cost is 450, which is more expensive than some of these formations, but it only goes up based on the upgrades you give the vehicles. If you like Flyers these could be nice and they always have the bonus regardless of proximity which is also a good thing. However, I don't know of anyone that would actually use a Bomber. I think most players would rather they just had 3 Razorsharks. Still, if you are already bringing flyers, this could be a small step to get some extra staying power in your air force. Personally, I don't like the codex flyers, so this isn't appealing to me, but it might be to some other people. Bonuses: Stormsurges re-roll missed To-Hit rolls against targets within 12" of the Ghostkeels. Hitting the same target with 2+ units from this formation disallows that target from Running or moving Flat Out in their next turn and cut their charge distance in half (round down). Summary: This is the obvious money-grubbing formation that GW threw into the codex. They want your money, so if you give them a LOT of it, they'll give you this formation as a reward. The accuracy bonus doesn't seem all that great, but could be more useful with the small Pulse Blastcannon blast profile. 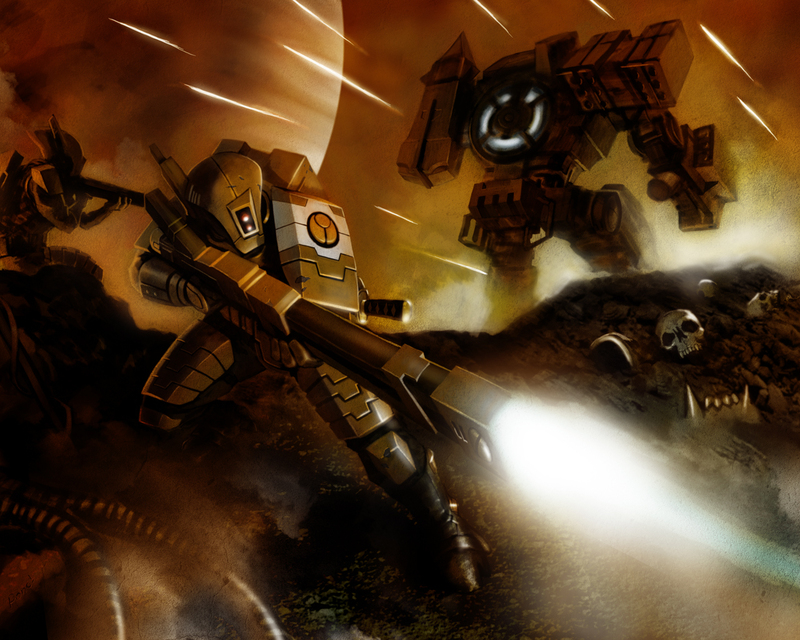 Especially when intercepting and they happen to land near the Ghostkeel. The slowdown effect isn't very good either. The enemy still gets to move and (albeit less effectively) charge. The only time I can think of this being useful, is against a unit that can run AND charge (Orks) or against something like an Imperial Knight where a failed charge is disastrous. HOWEVER, keep in mind that the Stormsurges can split their fire, so you could inflict this slow-down effect on quite a few units with just two Stormsurges. So that makes this formation actually quite good against Orks, who heavily rely on their ability to Run and/or Charge. Forcing an entire Ork army to move 6" a turn and charge at half-distance is crippling in the extreme and almost completely negates their Waaagh bonus. If you are already taking the Stormsurges, then why not throw in a Ghostkeel for the bonuses? It can only make your opponent's life harder. There is a lot to take in here. Time will tell which formations will become the new favorites, but you can be sure that the fun is only just starting. How does Split Fire work with this formation's special rule I wonder. 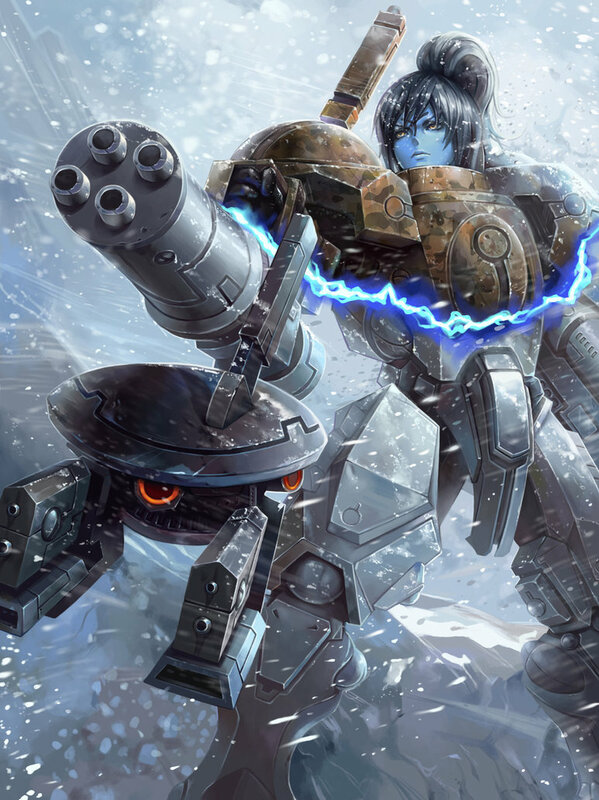 Will the Fireblade operating a Tidewall turret count towards firing at one target while the rest of his unit combines fire on another target? You don't have to take the Command: Contingent Headquarters detachment, it's listed as 0-1 in the 'dex unless I missed something. Also, the Core Hunter Cadre is a lot nicer than I think you give it credit for. Sure, it's not as great as the Retaliation or Optimized Stealth Cadres, but give you have to have it for the whole Formation to be used - and assuming you already use anything it "taxes" - it's just absolute gravy over a normal CAD. Just now realized you mentioned the Command formation was Option under the Hunter Contingent entry, but then later called it a "tax." Which doesn't make sense, since it's optional. That's what prompted my other comment. The player must reroll both the scatter die and the 2d6. You may indeed re roll your blasts with the AIC. Look up blast weapons and rerolls in the BRB. Thanks everyone. I had my mind that blasts only worked for "twin-linked"
I'm trying to figure out how to use some of these formations, for example the Retaliation Cadre requires 3 units of XV8 battlesuits + a Riptide. Which is 4 elite slots, while the hunter cadre only has 3 elite slots to spend. Is there something I'm missing here? Because a few of the formations seem impossible to meet the requirements for. These 'detachments' can also be combined with a standard FOC army (aka Combined Arms Detachment), but that may not be the ideal way to use them as they have stronger buffs in formations. It may be better to think of them as specialized battalions put together around a command core for a specific mission that would not be possible under the traditional FOC (though you are still perfectly fine using either organization method. A third way of organizing your army is to simply take whatever models you like. This minimizes or more often negates any benefits that formations give your army, and that may reduce your power to draw forth your enemy's tears. Follow these links to a couple of leaked pages from the codex about how to organize your army. Hope it helps. I know it can be a little confusing, just remember that you can use any of the three methods you like, just know the benefits and potential pitfalls of each before you start. Buff commander from hunter cont, joins crisis from CAD, could crisis then combine fire with units from hunter cont? I love my remora, def want to continue fielding them! Was thinking Hunter/farsight so I could take crisis instead of 2 more normal troop choices! Unfortunately, No. When an IC joins another unit, it takes on the characteristics of the unit it joins. Since the CAD crisis couldn't normally combine fire, adding the Contingent commander doesn't change that. HOWEVER, it does work the other way. For example: you could add a commander to a unit of Stealth Suits from the Optimized Stealth Cadre, and he would get all the benefits of the formation if the unit is within 6" of the Ghostkeel. Slap a target lock, two missile pods, and a Velocity Tracker on him. You'll hit stuff at BS6, ignores cover, and on rear armour too!